Alpha Pharma is a steroid drug with anabolic and moderate androgenic effects – Rexogin. The main component of the drug is an aqueous solution based on stanozolol. The pharmaceutical company produces a steroid in a package of 10 ml, 10×1 ml at 50 mg / mg.
Stanozolol was first produced at Winthrop Laboratories. Initially, the drug was intended for racing horses and only after a long period of time began to be used by athletes. Chemically, the steroid is directly opposite to progesterone. At its core, stanozolol is a derivative of dihydrotestosterone. 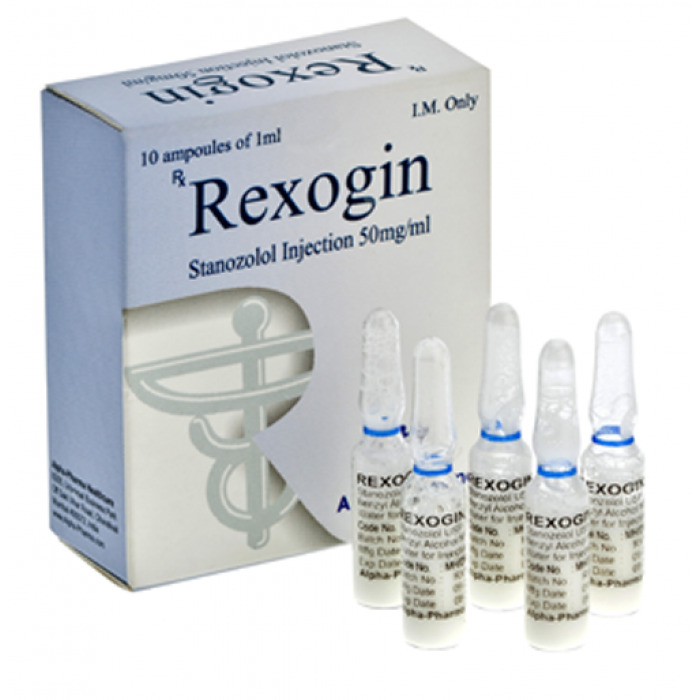 The active ingredient Rexogin differs from similar substances in that it does not have an attached ether. It also does not prevent the prostagensive effects of nandrolones. One of the advantages of an aqueous solution of stanozolol is the rapid absorption into the blood, due to which the steroid produces an instant effect. Injections are bad because bumps are formed at the needle insertion sites, and the injection procedure itself is quite painful. Rexogin is valid for 8 hours. Despite the short duration of activity, degradation products can be detected within 1 year after injection. The absence of an attached ether does not make steroid administration less noticeable – the latest equipment is able to detect metabolites even after several months. This feature of the drug makes athletes have a choice: prepare for competitions without using Rexojin or take a chance on a career and complete a steroid intake course. Many stop at the second option, so cases when a prohibited substance is detected on a doping control in an athlete’s body are not uncommon. One of the most prominent examples is Ben Johnson. The athlete was deprived of the Olympic gold medal, received for the best results in the sprint due to the fact that blood was found traces of a steroid. As a result of active stimulation, fat deposits are burned. The relief, venousness, muscle drawing increases – the steroid does not cause a noticeable increase in muscle mass, but improves its appearance.